Hot drink accident causing burn injuries or a scald – How Much Compensation Can I Claim? Burns and scalds from hot drinks affect the quality of your life, and in many cases, they can cause you some severe physical damage. You can be burned by hot drinks in a number of different situations – you could be scalded by a hot drink in hospital or you could have suffered a hot drink burn on an aeroplane. That’s why at Accident Claims UK, we have put together this comprehensive guide to being burned from a hot drink and how you should claim for damages if it happens to you. What should you do if a hot drink has caused you a burn or a scald injury? How do you claim for compensation if an accident involving a hot drink has caused you a burn injury or a scald injury? Hot drink burn or scald accident in the workplace – can you claim? Suffered a burn injury or a scald injury in a café? Can I claim for compensation against a fast food restaurant for a hot drink burn or scald injury that was not my fault? Can I make a successful claim for compensation against a restaurant if I have been burned or scalded by a hot drink? If I claim for compensation, what can I actually claim for? Can cafes or restaurants be made to compensate me if my child is scalded or burned in a hot drink accident? How severe is the burn injury or scalded you suffered in the accident involving a hot drink? How much compensation could I for a burn? If you are scalded or are burned by an accident involving a hot drink, why should you choose our firm to represent you? Phone us for advice – totally free with no obligation – and get guidance on whether you should start your compensation claim. Regardless of the severity of the burn, where it happened and how it happened, this guide will cover everything related to burn injuries or scalds from a hot drink. We’ll also point you in the direction of several medical advice pages that you should be aware of which will help you both stay safe and recover as quickly as possible. If someone else is to blame for your burn or scald injury you suffered from as a result of an accident with a hot drink, the information on this page will help you make sure that you are fully compensated for the effects that this type of injury can have on your life. The first thing that you should do after you have been burned or scalded in an accident involving a hot drink is to tend to your injury. The NHS recommends that you cool your burn for 20 minutes with lukewarm water. Make sure that the people around you know that there is extremely hot liquid nearby as well, so they don’t get injured either. Treating your injury with hot coffee burn first aid as soon as possible is very important so you can start your recovery. The next step is to start getting together all of the information you can about the accident. The more information you’re able to gather, the stronger your claim for compensation will be. Take a photo of the surrounding area and your wound so that your solicitor can show how the accident happened and the injury it caused you. We also recommend that you take down some witness details if other people saw the accident. Additionally, you should note down any details of vehicles if they were also involved in the accident. All of evidence adds up so that means we make your claim even stronger legally. We understand that gathering all of this information and taking pictures just after an accident isn’t always possible because of the shock and pain you’ll be suffering from. But try your hardest to take as much evidence from the incident as possible because it will help your scalded by hot coffee claim case further down the line. This is the best way to receive the fullest compensation you’re entitled to for your hot drink burn injury. First of all, you should get in touch with us. We will arrange a FREE consultation with you. In this consultation, you can tell us everything about the injury and how it happened and show us all the evidence you gathered from the situation at the time. This will give us a good idea about how we can take your case forward. Think of the free consultation as you giving us everything we need to start building your compensation claim for you. Our no win no fee guarantee means that you won’t lose anything for trying to claim compensation for your hot drink burn or scald. We will also use the information and evidence you give us so that we can give you a better idea about the level of compensation you could be entitled to. (But we’ll give you a guide to that a bit later on in this article so that you have an idea beforehand). Finally, we can also arrange a local medical check-up for you just to check that the danger has passed from your burn injury or scald. The vast majority of people come into contact with hot liquids in their work life. You may have been burned transporting the liquid which ended up injuring you around because it was part of your job responsibilities or you may have been scalded by a hot drink in school working as a teacher. However it happened, we believe that your employer as a duty of care to make sure that incidents like this don’t happen to you. 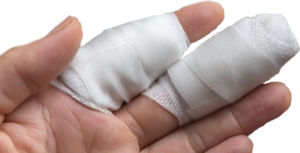 In many cases, being burned or scalded at work is an indication that insufficient attention has been paid to adhering to accepted standards of health and safety standards. If your workplace doesn’t meet the standards they’re legally obliged to with the handling of hot liquids and you get burned as a result, making a claim may be the only way to get proper compensation for your burn injury. Have you been burned by a hot drink at work? Our specialist team will be more than happy to discuss this with you as a part of our free consultation service. This is the first step that you should take if you want to get compensation for burns at work. This is one of the most common claims we help our clients with. Once again, this kind of claim is based on negligence with the café’s health and safety procedures. It’s up to them to make sure that you aren’t injured while you are on their premises. Making a scalded by a hot drink in a café claim is a simple process with our team. You can claim if you were injured by a hot drink at any quick service eating establishment. Whether you were at McDonalds, KFC, or Greggs, you can claim – even if you scalded your tongue on a hot drink in these establishments. It isn’t uncommon for employees at restaurants to spill drinks on their patrons. But unlike a wine spill, which is just an inconvenience, spilling hot tea on your hand can result in severe injuries and suffering. We can help you claim if you have been burned by a hot liquid at a restaurant. We’ll even assist you in showing you how the accident wasn’t your fault and how you should have been better protected. Did you receive a burn or scald that wasn’t your fault in any of these places? we can help you make your claim. Our team can use the correct legal channels to make sure you to receive the money that you are owed by these businesses because they were negligent with their health and safety. Falling, slipping, and tripping can all be dangerous enough on their own. But adding a boiling drink into the mix can make it even more severe. If you have suffered injury from a hot drink as a result of somebody else slipping, tripping, or falling, contact our team so that we can help you claim. We can also help you if it was you who fell down and burned yourself. We’ll work with you to identify whether the accident was your fault or the venue’s fault. An example of this can be as simple as a restaurant not putting up a wet floor sign. Even little things like this can make all the difference when you are making a claim. On many occasions, slips, trips, and falls are the result of another person not paying enough attention. Whether you have bumped into somebody and burned yourself as a result or they have spilled hot coffee on you because they weren’t paying due attention, you can claim. Just because the accident didn’t happen in somebody’s private property should not stop you from getting the compensation that you deserve after suffering the pain of what can often be a very upsetting experience. Our team can help you make a hot drink burns claim if you have received a burn in place used by the public in general. If you have suffered a burn or a scald injury in any of the places listed below, please don’t hesitate to contact us. You may have already seen the several McDonald’s hot coffee burn pictures that are all over the internet. If you have had a similar experience, let us help you get the compensation you deserve. “General damages” are the compensation that you can claim for the suffering that you had to endure because of the accident. This takes into account important factors like psychological damage and overall pain. If you had to pay somebody to help look after you because of the hot drink accident, we can help you reclaim these costs as a part of your case. The person who has looked after you while you’ve recovered is the person who should file this claim with us. This is when you are forced to take time off from work to recover from your burn or scald wounds because of your accident. It is stressful enough receiving a bad burn injury or a scald. But when that’s compounded with money worries, it can cause you severe distress. These are costs that you’ll incur if you need to pay for travel to and from the doctors’, the hospital, or another place that is treating you because of the accident. These costs can sneak up on you so make sure that you keep all of your receipts, detailing how much everything is costing you. This will help us make your claim further down the line. There are all sorts of medical costs that are involved in getting professional care for your injuries after a burning or scalding accident. No matter how many different costs you have to pay, let us know how much you are spending, and we will help you get that money back. Getting injured by a hot drink should not leave you out of pocket because of costly medical expenses. Contact us to start your scalded by hot water claim. If you are a parent, the only thing worse than you getting burned is your child getting injured. You may have seen shocking headlines such as “baby scalded by hot coffee” in the papers recently. This type of injury and distress should never go without its victims being compensated. We offer the same no win no fee service to families of children who have received these hot drink burns too. We understand just how serious a child burned by a hot drink is. Not every burn injury will affect a victim in the same way. It will all depend on the area that is affected, how long your skin was in contact with the hot drink, and how quickly the burn or scald was treated. Most burns that come as a result of a coffee or hot tea injury would be classed by a doctor as a first-degree burn. A first-degree burn means that the burn has only affected the top layer of your skin. Although this is still incredibly painful, there shouldn’t be any long-term disfigurement. There may still be some scarring that results from the burn though. More severe scalds can cause second-degree burns. These are burns that have reached the inner layers of your skin (such as the epidermis and the dermis). Burns like these can, unfortunately, mean that your skin might not go back to how it was before you were injured. Examples of these burns can be found in hot coffee burn documentaries you might have seen recently on TV. In many second-degree burn cases, there can be some nerve damage which means that you won’t be able to feel anything where you were burned. Second-degree burns settlements tend to be much higher because of how severe this kind of injury is and the intensity of the suffering. Top layers of skin peeling away. All of these things are painful and can seriously impact the quality of your life. When you are making your claim, make sure that you take pictures of these injuries and describe the pain you’re feeling as vividly and clearly as you can – especially if the injury will have an impact on your work life. We can then use these pictures and statements to strengthen your case for compensation, giving you a better chance of making a successful hot tea scalding claim. Every burn is different – how it came about, the temperature of the liquid, the parts of your body it affected, and so on. Assessing how severe the burn is can be difficult without proper medical help. For that reason, we offer a service that will put you in touch with a sympathetic local doctor who will examine your wound. Not only will this medical professional give you advice on how best to treat your injury for a full and quick recovery (if possible), they will also produce a detailed report which allows us to give you a good idea on how much compensation you can claim for. At the bottom of the article, we have attached the NHS guide on how to treat hot drink burns. This examination will be free, and we can usually arrange it at your nearest medical centre. How much compensation could I claim for a burn? The first thing that we must mention is that everything below is only an estimate. There are so many different circumstances that go into making a hot drink injury claim so there is no average compensation for burns. By contacting our team and arranging a free consultation, we will be able to evaluate your exact circumstances in order to able to provide you with a much more accurate and reliable claim estimate. There are some general guidelines for what amount of compensation for burns you are entitled to. These burn injury settlements amounts are based around what other people have received in the past however please be aware that each case had their own unique circumstances that will have played a significant factor in the burns claim amounts awarded. Loss of expected remuneration from work £10,000 to £100,000 This will scale based around how much you earn on a typical year. We will take into account your previous year’s earnings along with your other financial circumstances when calculating this amount. You lost out on benefits payments £5,000 to £500,000 This, again, is worked out on what you would have earned had the injury not occurred. Suffering and pain £1,000 to £200,000 Varying factors which all depend on how much pain was caused. This is normally verified by the kind of burn that you received, and where it was on your body that you received the injury. Mental damage £3,500 This is awarded if there was a fear or expectation of death caused by the accident. Very severe facial disfigurement - women £36,000 to £74,000 Normally given to younger women suffering severe facial disfigurement. The size of this award is linked to the psychological damage that is caused by the effect of the disfigurement. Not as severe facial disfigurement - women £23,000 to £36,000 This is the same as the above, however there isn’t as much physical damage involved. Significant facial scarring - women £13,650 to £22,875 This normally covers the effects that are left from surgery. The psychological damage also still plays a part in determining this amount of compensation. Less significant facial scarring for women £3,000 to £10,000 This is when there are a few scars which are small in size or there is one larger scar which can be easily covered up by make-up. Minor facial scarring for women £1,300 to £2,675 This is normally for very small or temporary damage that caused by the hot drink burn or scald. Very severe facial disfigurement for men £22,625 to £50,000 Normally given to younger men who have been put through severe mental anguish as a result of the injury. Less severe facial disfigurement for men £13,650 to £22,800 Where there's permanent disfigurement but the injury had a lesser psychological impact. Significant facial scarring for men £6,925to £13,650 This means scars that are easily noticed by others. Less significant facial scarring for men £3,000 to £6,925 For injuries when someone can only see the scars close up. Minor facial scarring for men £1,300 to £2,675 Very minor scarring was caused. Visible scars to body £5,950 to £17,275 This is where a scar or scars are clearly visible, and they have affected your quality of life after the accident has happened. Less visible scars to body £1,800 to £5,950 A few smaller scars that are only visible if you look at them closely. Severe bodily scars Probably exceeding £79,700 This is entirely dependent on the mental trauma that you had to endure and if you have suffered a physical disability as a result of the hot drinks burn going down your body. There are a variety of different ways that you can be compensated for the suffering that you have been put through. But we cannot stress this enough – each claim is different. To get a more reliable estimate for compensation on your own personal hot drink injury claim than using a burn compensation calculator you might see online, get in touch with our team so that we can arrange a free consultation with you. Our specialist team of solicitors work for you on a no win no fee arrangement. If you don’t win your case, then you won’t have to pay us a penny. This gives you the peace of mind that there aren’t any hidden costs building up in the background while we’re assisting you with your claim. We will also discuss with you, in detail, how much we will charge if you do win your compensation claim. Everything is fully transparent because we understand the amount of stress that you are already under because of your injury – we don’t want to add to that. Because we operate on the no win no fee arrangement, you know that you will have a good chance of gaining the compensation that you deserve because we work with clients with a strong case where we feel confident in representing you legally. This is because we won’t get paid if you don’t get the money that you are entitled to. We not only offer our free consultation service where you can talk with us about your experience and start to build up your case for compensation with you. We also offer you a free medical check up that can also be used to prove the damage caused by your hot drink injury which we’ll then present to back up your case. These two important factors are including in our no win no fee service. Additionally, we also have years of experience in dealing with hot drinks claims. So, let our professional team guide you through the process of making sure that you get the burns compensation pay-out that you deserve. There is no reason that you should suffer because of an accident that was not your fault which resulted in your suffering from a burn or scald injury. Please reach out to a burn injury lawyer. No matter how difficult the accident and recovery from it has been, we make sure that you will receive everything you’re legally entitled to. If you have been involved in a hot drinks burns accident, call our team. To get in touch with our experts to set up a free consultation, call us on 0800 073 8801. This site will help you treat your wounds before you receive help from a medical professional. Making your recovery as quick and effective as possible won’t harm your claim in any way. We just want you to make sure that you are safe and on the road to recovery.